If you thought this was unprecedented, you were right: "It is unheard of for a Supreme Court nominee to give interviews during the confirmation process." That's according to WaPo's recap of Brett and Ashley Kavanaugh's emotional interview with Fox News anchor Martha MacCallum. From the standpoint of the Trump White House, going with MacCallum made a ton of sense: MacCallum is a well-credentialed female anchor who hails from the news side of Fox, not the opinion side. Via CNN's Kevin Liptak: "One WH official says Trump has been pushing to take a more offensive approach in defending the nomination and that this was how aides interpreted his command. 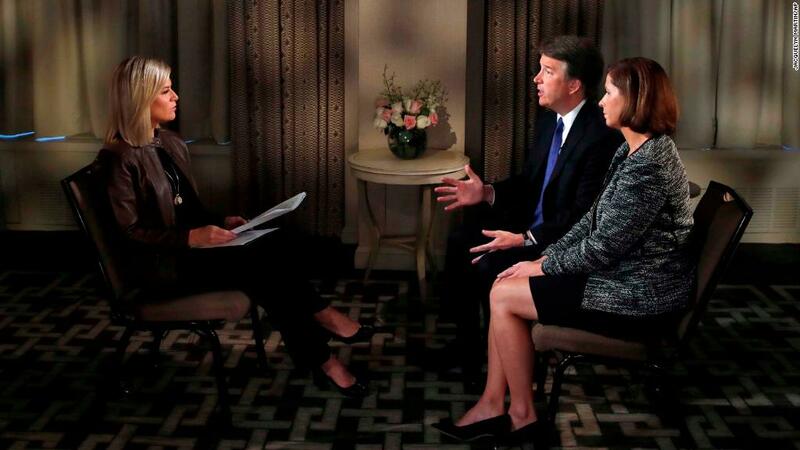 It's not clear that he specifically instructed Kavanaugh to sit down with Fox (though it's possible) but it was the result of his desire to be assertive in combatting the claims rather than just playing defense..."
"Not a good look for the Supreme Court..."
Law prof/CNN contributor Steve Vladeck texts me: "The interview is a microcosm of everything that's been wrong with this confirmation process. We shouldn't prevent nominees from speaking publicly, but to do so under these circumstances, in that context, and in a manner calculated to exacerbate the partisan divide over the nomination, is not a good look for the Supreme Court in the long term, even if it helps the political calculus for the nominee in the short term. It reinforces the view that nothing in this process matters at all except getting 50 votes by any means necessary..."
>> Another view, via CNN contrib Matt Lewis on Twitter: "People are more likely to rally to your defense if they see you're fighting, instead of being passive." So the TV interview was wise for Kavanaugh. "He hasn't controlled the narrative for a week, now..."
-- WaPo's Erik Wemple tweeted: "I would have liked to see Martha MacCallum press Kavanaugh on his relationship with Mark Judge. In all, though, I thought she did a good job -- and certainly didn't serve up only softballs, as many predicted." 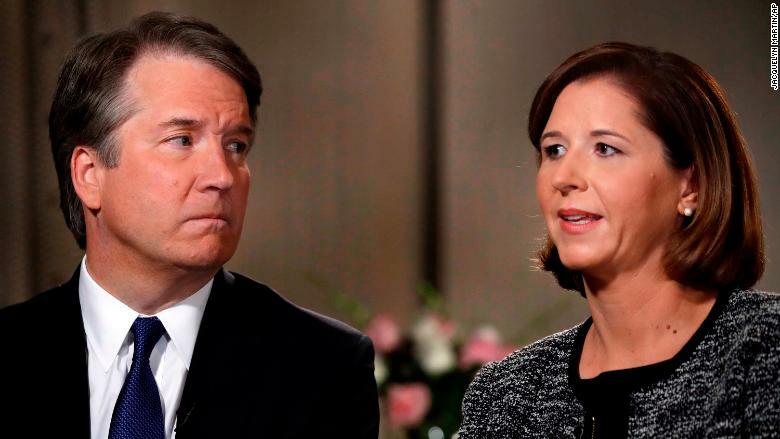 -- Brian Fallon, one of the left's leading anti-Kavanaugh organizers, tweeted that "MacCallum is pressing Kavanaugh more than I would have guessed..."
-- Earlier in the day, Mitch McConnell said "Judge Kavanaugh will be voted on here on the Senate floor..."
Ronan Farrow and Jane Mayer spent much of Monday explaining and defending their reporting about Deborah Ramirez. Charles C.W. Cooke, channeling many conservatives' reactions to the story, said it "looks reckless beyond all reason." Drudge's Monday evening headline asked, "RONAN MISFIRES?" Beyond the partisan battling, many journalists raised questions about the lack of corroboration of Ramirez's account, and the fact that it took time for Ramirez to assess her own memories. Some suggested that their news outlets would not have published the story. Mayer rejected that -- and pointed out that she "found a classmate who heard the identical story at the time." Farrow said on "New Day" that "this is a fairly high level of evidence for this kind of a case." And David Remnick noted that the pair "wrote with fairness and transparency about what doubts there might be." >> The NYT said that it "had conducted numerous interviews but was unable to corroborate" Ramirez's story. Some folks tried to turn this into the NYT v. TNY. But the paper dismissed that, noting that it "did not rebut her account and, unlike The New Yorker, was not able to obtain an interview with Ms. Ramirez..."
Megan Thomas emails: This is a really good one from The Atlantic's Megan Garber on "#WhyIDidn'tReport and the weaponization of haste." This line stands out: "The game clock, the time bombs, the midterms, the calendar, the fleeting moment, the lifetime appointment, the mechanical tickings of political partisanship..."
Trump is set to meet with Rosenstein on the very same day that Kavanaugh and Christine Blasey Ford are set to testify. >> Jim Acosta on "AC360" Monday night: "It's almost going to be like watching tennis, looking up and down Pennsylvania Avenue." >> NYT's James Poniewozik had the tweet of the day: "Thursday would be a good day for CNN to launch CNN8, 'The Ocho.'" They're billing the combo as "the world's largest audio entertainment company." SiriusXM is paying $3.5 billion in an all-stock deal for Pandora that had been foreshadowed for a while. As Chris Isidore reports here, "Pandora's ability to stay an independent company was very much in doubt. SiriusXM had already invested $480 million to buy 19% of Pandora's stock last year, and it was widely reported to be looking at a full purchase..."
-- Peter Kafka tweeted: "Giant satellite audio company buying giant internet audio company could be an antitrust problem, but this one seems to pass what economists call the Trump/Murdoch test..."
"Two veteran NBC executives — George Cheeks and Paul Telegdy — were named co-chairmen of NBC Entertainment on Monday, replacing Bob Greenblatt at a time of upheaval in network television," the LAT's Meg James writes. It was reported on Friday that Greenblatt was ready to step down, and was going to talk with Steve Burke about it over the weekend. "But if his departure is not a surprise, the suddenness is. His last day is Monday, the same day the 2018-19 television season begins," the NYT's John Koblin writes. >> Other factors noted by Koblin: "Greenblatt wanted to see if Comcast's last-minute bid for 21st Century Fox's properties would work and could possibly expand NBC's portfolio. (It did not.) And two of Mr. Greenblatt's close friends — the producer Craig Zadan and the Broadway star Marin Mazzie — have died in the last five weeks..."
>> USA Today's Dan Wolken: "Tiger Woods' first win in five years feels like a new beginning, not the end..."